Posted on Wednesday, July 25th, 2018 at 9:33 am. I was never a cargo bike kind of guy. I never had an interest or a need for one. An e-cargo bike? You’ve got to be kidding me, and that’s not a knock against e-bikes. In fact, I think e-bikes are cool for all its intended purposes. But here I was staring at one at the 2017 InterBike. Gosh I don’t know why I am looking at it. They got my attention with this InterBike elevator pitch. I’ve just been bombarded with a lot of eBikes that follow more or less the same formula: a heavy boring frame slapped with some equally boring motor unit with triple digit range per charge. You can only hear pitches about the same power unit from people so many times. However, this pastel blue GSD from Tern is different. It’s got 20 inch wells, could stand on its own like the statue of liberty, adjustable to be used by family members (or housemates, bros, whatever) between 4’9” to 6’3”, integrated front and rear lights, can be loaded with panniers, a front rack for a milk crate-type box… and dual baby seats. Am I looking at an e-bus then? Despite my reservations, I decided to try one out. Months later, a Tern rep literally dropped one off at my house, fully charged and ready to go. I had three weeks to ride it around town to buy groceries and take my toddler son out for a spin. I am certain it’s the heaviest bike that I’ve ever ridden, save for one of those silly four person tourist trap rental bikes that you instantly regret the moment you pay for it. Tern gave me a model with dual batteries with an extended range up to 150 miles. A range that theoretically would be sufficient to do a round trip down to Silicon Valley and back in one charge, but that also means it’s heavier than the specified 60lbs weight with a single battery to power this aluminum-frame rated to carry up to 400lbs. There’s no fancy carbon fiber handlebar or titanium-bolted stems here. Its stock components tend to weigh a little more for the sake of safety and durability. It’s got a comfortable seat, equally comfortable Ergon grips, and a pair of regular shoe and shin friendly pedals. It’s really a SUV on two wheels. Shoe and shin friendly pedals. Personally I'd go for something grippier such as the Shimano PD-MX80, though. Magura MT5 levers felt solid in my hands and were problem free. Release the spring-loaded cord at the bottom and you will be able to reverse the front wheel to save space. Following that train of thought, there’s a sense of invincibility whenever I take it out for a “spin.” Yet unlike your below average SUV, the GSD, given its heft and upright geometry, is surprisingly nimble to maneuver. I am sure its low center of gravity and the fact that its wheelbase, despite its elongated appearance, is ever so slightly longer than a standard bike, beefy Boost thru-axles and fat 2.4″ Schwalbe Super Moto-X tires all contribute to its stability. The panniers were great to haul a ton of stuff but access becomes an issue when a child seat, like the excellent Thule Yepp Nexxt Maxi here, is installed. I love the Bosch Performance Line drivetrain. Power was smoothly delivered whenever I needed it. While I think Bosch can improve user experience by reworking those clunky buttons and display, it nevertheless worked as advertised in giving me five different case modes from gently assisting my walk-a-bike effort (handy to maneuver the GSD to a bike lockup) to full blown turbo mode that gives the most ooomph. 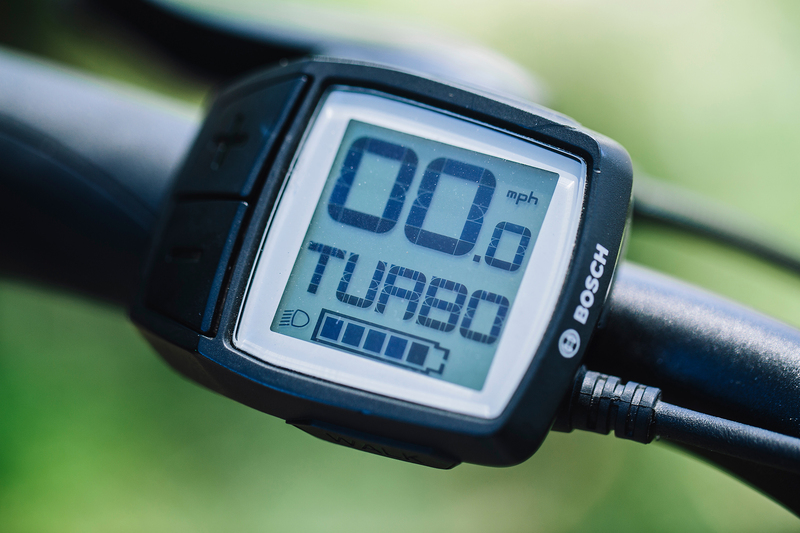 I found myself using the turbo mode during my test for the maximum power assist and a more lively, responsive feel, but I did find myself switching to touring or economic mode more whenever I am going downhill or once I am rolling on speed. One thing that I’ve learned is that the GSD likes to cruise steadily while seated and is a far more enjoyable ride to stay around 20 mph where the power assist cuts off. The power cutoff brings back the abrupt reality that this is one hefty bike, no matter how much power I crank into the clutched Shimano 1×10 drivetrain with a 11-36 cassette. I might not be getting a full human-powered workout, but I can do grocery runs while remaining relatively sweat free. The LCD display also controls the integrated front and rear light, and the four-piston Magura MT5 hydraulic disc brakes were amazing. Paired with 180mm rotors, The MT5 modulated nicely and I was able to stop on a dime considering all that heft with no audible brake squeal. The kickstand takes a bit of practice but it was rock steady while loading groceries. Plenty of power from the quad piston Magura MT5 hydraulic disc caliper and 180mm rotors. Besides being a badass grocery hauler, I loved bringing my son out on the bike. The utilitarian racks allowed me to install the Thule Yepp Nexxt Maxi seat much closer to me than a towing trailer ever would be for better handling without the extra distance between me and my son. It’s nice to be able to not have to yell in order to hear each other while riding. My son couldn’t stop smiling and laughing during his first ride, a 15 minute trip, to our favorite grocery store. With a half-mile uphill kicker averaging 9%, I never thought of taking my kid along on a towing trailer, but it was a no-brianer with the GSD. The little dude was actually saddened to see the bike go back a few weeks later and said “why don’t you just buy one.” I don’t know if there’s a better incentive to buy a bike than that. Front end folded and standing upright for storage. With a starting price of $3,999, it costs about the same as a very good road bike, a reliable motorcycle, or a child’s daycare expenses and it definitely commands a deeper commitment than a regular bicycle. If you’re in the market for an e-cargo bike, however, the GSD is one well-made machine designed for the long haul. For 2019, Tern will be adding a higher performance model with a higher-torque Bosch Performance Line CX motor along with a higher energy battery, a heavy duty Enviolo N380x cargo hub, and an integrated Abus wheel lock for additional security with a starting price of $4,995.